ScreenTwin is a great opportunity for those who have always wanted to record video demos from the desktop or show their PC screen to friends. ScreenTwin captures everything that you do on your screen and helps you share your desktop activities with those who might find it interesting or useful. You can create video lessons, software demonstrations, presentations – with just one mouse click. And you can broadcast your desktop to almost unlimited number of people at whatever distance they are from you, and they will see exactly what you are doing on your computer. 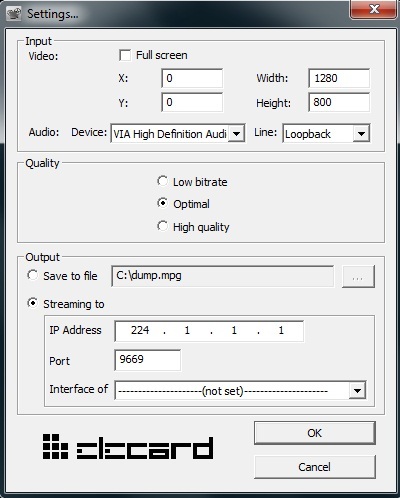 The streamed or recorded video can be accompanied by the sound that is taken from the specified source. The main advantage of ScreenTwin is that the whole process of capturing, transmission, and playback takes less than an eye wink, because the application is based on Elecard Low Delay Codecs that greatly reduce the period of multimedia encoding and decoding process. The product is available on an “AS-IS” basis.